Hello. My name is Tonya. I’m a Pinterest addict. I blame my cousin Shannon for getting me hooked. She is pure evil. Perhaps some of you have had a similar experience. One of your friends suddenly has all kinds of interesting crafts, baked goods and ideas for fun activities for children. You make the grave mistake of asking where these ideas magically materialized from and then you hear a word. Just one. Pinterest. And that one word suddenly transforms into a time-sucking overwhelming need in your life. If you are reading this wondering how to pronounce this word you’ve never seen before. Run away. Run away from your computer right now. Save yourself while you still can. It is too late for me. But you may still be able to escape. Oh no. You’re typing it into your search engine now…aren’t you. I’m so sorry. Tell your husband and children I’m sorry too. They’ll come looking for you in a couple days and find you, eyes glazed over, index finger cramping from all the mouse-clicking – but with 1000 new ideas for dinner, desserts, home decor and party ideas. I have become a woman obsessed. You see, I have no good ideas on my own. But I’m very very good at stealing them from other people. Pinterest has given me unlimited access to the genius of others. It’s a sickness. That I love.I also love caramels. And when I saw this recipe on Pinterest, I had to give it a whirl. 6 minutes to achieve a little piece of heaven? Yes please. All microwaves have different power, so watch it closely at the end. The last two minutes might be slightly too long, or short, depending on your machine. I would suggest a bowl with a pour spout and a handle if you have one. I used a big measuring bowl with a handle. The bowl is going to be hot hot hot when it’s done. Also, make sure whatever bowl you use is only full about 1/3 of the way as the caramel will expand and bubble up as it cooks. This recipe says to wrap the caramels in wax paper, but I’ve never really had luck wrapping stuff in wax paper. 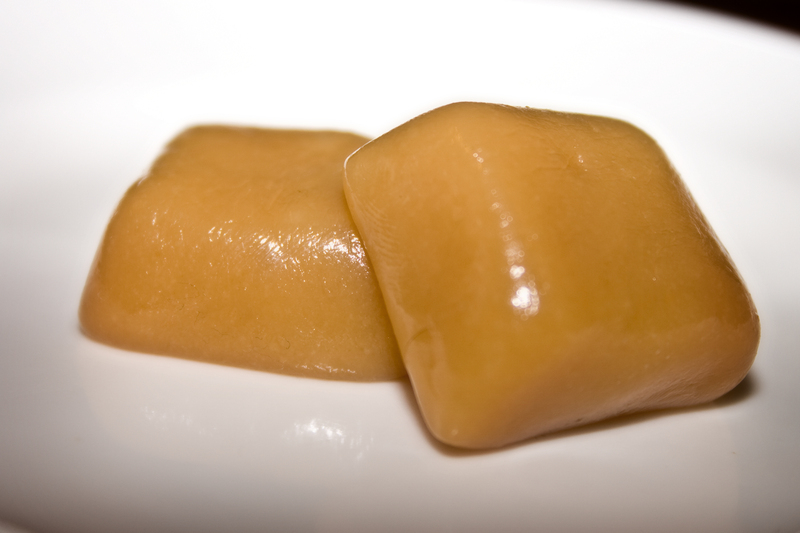 Maybe I just didn’t wait long enough for these caramels to cool. But when I unwrapped one of them from the paper, half the candy stuck to it. Lame. Total waste of amazing caramel. Last tip, make sure you let these cool completely before cutting them. If they’re even a little warm still, they’ll be too soft to cut straight, will stick all over your knife and you’ll have a big mess. Even messy though, these are delicious!! 1. Lightly grease a 9×9 square dish. In a large bowl, combine all ingredients. 2. Cook 6 minutes in microwave, stirring every 2 minutes. 3. Stir and pour into the prepared dish. 4. Sprinkle lightly with salt (if desired). 5. Allow to cool, then cut into pieces and wrap in wax paper. Store in an airtight container.